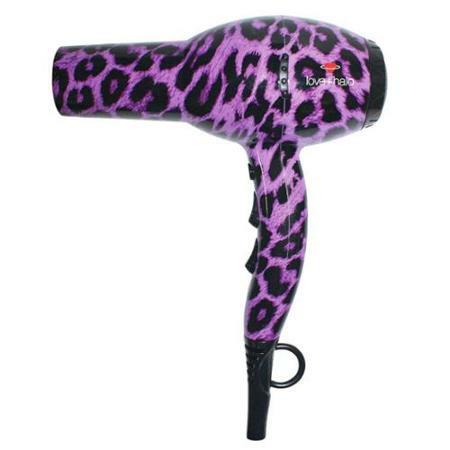 Fun and wild the Love + Halo Animal print Lilac Leopard Hair Dryer is loaded with many features which includes 4 temperature settings, 2 speeds, a cold shot feature that locks in those beautiful curls, 2 nozzles, and a 9 foot power cord. This turbo hairdryer also has a very quiet, but powerful 1700 Watts motor with an anti-overheating device. Another safety feature is its self-extinguishing, shock and temperature resistant thermoplastic body, and a removable stainless ?lter. This hair dryer is handy, lightweight and is designed to reduce hand fatigue.